Layout mortises, mark shoulders, scribe circles, the Digital 3-in-1 Marking and Mortising Gauge does everything a traditional gauge does and more. But that's not all. As a digital gauge, it does it all with an accuracy of 1/1000th of an inch. 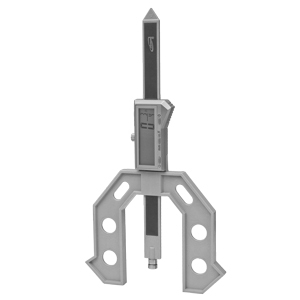 Versatile 3-pin design allows you to set up the gauge in several different configurations, depending on the operation. Solid stainless steel construction. Set the heights of router bits and saw blades with greater accuracy! This 3-in-1 digital router combines the functions of three tools: a depth gauge, height gauge and thickness gauge. It is a metal rule with a Super Large LCD display, housed in a heavy-duty polycarbonate frame which allows it to stand freely. 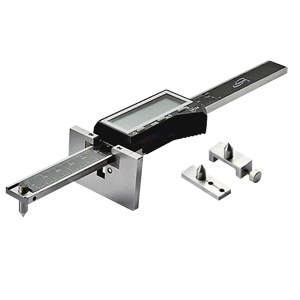 The measuring range is 0-6", with a router depth of 0-3.10" and a slot depth of 2.90". It features buttons for on/off as well as zero set functions, and it easily switches readings from inches to metric to fractions at a touch. Two hardened steel measuring anvils (flat and point) are included. Accurate to within 0.001" per 1"
The Multi-Max is two depth gauge measuring systems, a chisel angle checker and drill point gage in one easy to use tool. Drill Point Gauge -Properly sharpened drill bits save time and money. Let the Multi-Max be your guide to a perfectly sharpened drill bit every time. Chisel Angle Gauge -End the guess work when sharpening chisels. Place your chisel into the Multi-Max chisel checker for the optimum chisel angle. Depth Gauge - Easily check the depth of grooves, dados, holes, material thickness and much more with Multi-Max. Stainless steel rule with deeply etched markings are easy to read and will never wear off. Router Bit Depth Gauge - Set the depth / height of router bits accurately. Place the the Multi-Max on the base of the router or router table top and raise the bit to match the dept / height you need. Height Gauge - Check heights up to 3'. Uses the same stainless steel rule as the dept gauge. Calibrated in inch and metric unties. 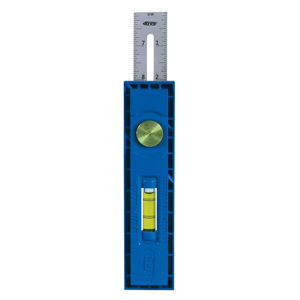 The Kreg Multi-Mark (model KMA2900) is an incredibly handy multi-purpose marking and measuring tool, perfect for a wide variety of household and jobsite applications. The Multi-Mark features three different scale configurations, a built-in level, a handy 3/16-inch reveal gauge, and much more. Whether you need to transfer a measurement for that last ceramic tile, layout some mitered corners, or just straighten a few simple picture frames, the Multi-Mark is the only tool you'll need to get the job done. Articulating pencil head increases flexibility and versatility of materials and objects that can be scribed. Allows you to adjust the AccuScribe PRO to accommodate difficult and awkward applications such as scribing around windows and doors. Ideal for transferring lines (for siding around windows), flooring, marking gauge applications, and scribing circles and radii. No need to use a builder's square or chalk box; using the peel and stick backing, simply attach Square N Tape™ to any standard tape measure (sold separately) then slide and mark your board with the 8-in-1 SquareNTape™ from FastCap®! SquareNTape™ features include a 90° squared edge that lets you lay it across a board for 90° squaring capabilities. Notches at 1-1/2" and 3-1/2" make it easy to mark 2" x 2" and 2" x 4"s out of wide construction boards. SquareNTape™ also has marks at 1-1/2" and 3" for laying out plates for single and double stud layouts; perfect for window and door construction. Marks at 45° and 22-1/2° make it easier to mark angled lines, plus, it has a handy erasable notepad for writing down measurements. Made in USA. This 6-Pc. 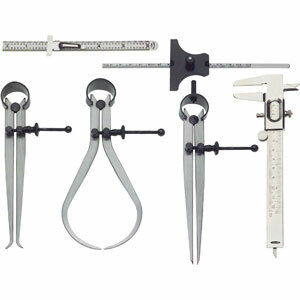 Measuring Set is a must have set for the serious or amateur hobbyist alike. Made of durable stainless steel, this set will enhance the accuracy of your wood turning dramatically. Includes: 6" inside caliper, 6" outside caliper, 6" straight dividers, 6" scale with pocket clip, fractional equivelant on back, 5" vernier caliper, millimeters scale on back, and 5" depth gauge, millimeters scale on back.